I feel as though I may be slightly late to the party with these tweezers – how have I only just discovered them? They are amazing for travelling, when lighting in hotel rooms can often be so bad that it’s impossible to do any tweezing! The best place to tweez eyebrows used to be in the toilets of aeroplanes, but sadly we can no longer do that, for obvious reasons. Plane toilets are also great places for examining your open pores and squeezing blackheads – only lighting-wise, though, it’s probably not the most hygienic of places to be messing about with your skin! 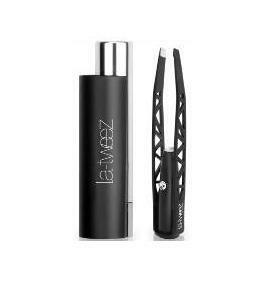 LA-Tweez tweezers have a small but powerful light that beams directly onto your skin illuminating only the exact area that you need to tweez. There’s also a mirror in the case so that you can see what you’re up to. I prefer to use a larger hands-free mirror if at all possible so that I can use one hand to stretch the skin around the brow slightly, and the other to pluck stray hairs. Great invention, these tweezers! If you want to see them up close and ‘in use’, have a quick look at the video below! Next Post Orly Black Board: Professional Nails for under £1!